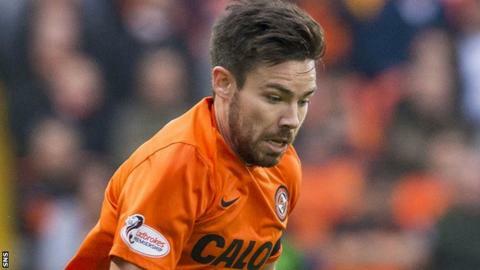 Dundee United midfielder Ryan Dow says he has no problems when it comes to playing on artificial surfaces. Dow has missed the majority of this season with a niggling groin complaint but says the surface does not have an impact on his injury. "It doesn't bother me," Dow told BBC Scotland. "The grass pitches at this time of year are not the best so it is a wee welcome break to get a flat surface for a change rather than a muddy pitch." Dow had an operation at the end of last season to eradicate the problem and has no concerns about playing on synthetic turf. "I've not heard anything from the surgeon or the physio that I've had to say I cannot play on AstroTurf and obviously with the weather we have had in the past couple of weeks we have trained on AstroTurf and none of the boys have felt any old injuries flair up," Dow said. "Unless injuries like that flair up everyone will just continue as normal." United travel to Hamilton on Saturday, with the surface at New Douglas Park coming under criticism this season. United boss Mixu Paatelanain is believes synthetic surfaces have improved over the past few years. "The latest Astro pitches are in my view are ok," the Finn said. "In Scandinavia they are used a lot because of the weather. As long as they are maintained regularly and brushed regularly. If that is the case the latest Astros are almost as good as grass." Paatelainen played on one of the first artificial pitches in Scotland at Dunfermline but says that proved to be extremely unsuccessful. "That was not the best. That was more of an ice rink than a football pitch."